Campine Chickens’ intelligent nature, upright carriage, and stunning plumage make them a show favorite. They are rare in America, but they enjoy popularity in Northern Europe. They are an active breed, and they do better as show birds and layers than as pets. They weigh only four to five pounds, but they produce an average of three, medium-white eggs a week on modest feed. Although of docile temperament, detractors of the breed label them “wild.” Campines like their freedom and will chafe at confinement in good weather. Like many foragers they have an inherent intelligence necessary for free-range chickens. The term “cocky” applies to the Campine demeanor. They strut with the spirit of a fowlish thoroughbred. As a group they react to sudden movement with a flighty response. Their temperament probably accounts for their near extinction after World War II and their rare status even today. What Campines lack in personality they make up for in appearance. They have two basic plumages—the Gold and Silver Campine named for the splendid hackles around their neck. The gold variety has a orange hackle starting at the base of the skull stretching to the back cape. Silvers have the same configuration except with a snowy white hackle. The breast and wing consist of a gold or silver base color with an intricate, black, zig-zag lacing. 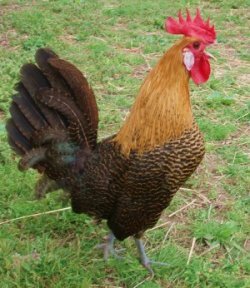 Campines have red pea combs and wattles that stand in stark contrast to their white earlobes. They have the color of a true, ornamental bantam. Avid foragers, the Campine needs ample room to roam, so build an adequate run. Confinement in the summer months leads to a form of fowl paranoia and generally unhealthy chickens. In winter months, Campines want for a large coop to protect them from the elements. Keep show fowl on wood shavings to protect their feathers from damage and dirt. Campines have a flighty disposition. Keep their environment quiet and calm. They like to fly. Use fencing wire high enough to prevent their escape.